During CHINAPLAS 2015, battenfeld-cincinnati China organized an Open House demonstrating a high output extrusion line for 400mm gas pipe and a LeanEx high speed line for 20mm polyethylene of raised temperature (PE-RT) pipe. Over 210 visitors attended the Open House in two days at battenfeld-cincinnati’s Shunde plant. “We see that the Chinese market needs both – top performance solutions for high-end applications and turnkey lines for standard products that are simple, easy to handle and quickly available,” said Toni Bernards, CEO of battenfeld-cincinnati China. At the Open House, the 400mm line for gas pipe line is based on a solEX 75 single screw extruder that is equipped with AC motor. It saves around 20% energy compared with a DC motor and achieves outputs of 1,200kg/h with a low noise level of below 80db. The helix 400 VSI-T pipe head with inner pipe cooling EAC (efficient air cooling) ensures homogenous melt and pipe quality with reduced sagging. As said, it is possible to produce large solid wall PO pipe with diameters up to 2.6m. The inner cooling in the pipe head reduces the length of the extrusion by 45% – from 85m to 47m. The PE material used at the Open House, BorSafe 3490LS, was supplied by Borouge, while the dehumidifying and conveying system came from Piovan. This energy reclaim system was used for pre-heating of the material, saving 30% energy, bringing the line’s combined energy consumption per ton of PE processed down to only 268kWh. The 400mm PE-RT demonstration line was already sold to Hebei BlucicinPlastic Industry Co. Ltd. before the Open House. The second line on display was a LeanEX line, which is available in five sizes: 63mm, 160mm, 250mm, 400mm and 630mm. The LeanEX concept stands for “lean extrusion”, i.e. simple, turnkey lines for standard PO pipe applications built with European technology and locally sourced screws, barrels, motor and drive. The line shown was a LeanEX 63mm line with a LeanEX C1-60-30 single screw extrusion extruder producing a PE-RT pipe with dimensions of 20×2.3mm at a line speed of 40m/min and an output of 320kg/h. 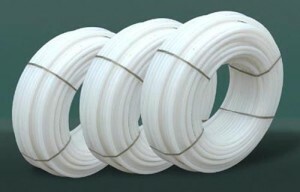 The high density PE (HDPE) XSene XRT 70/PE-RT Type II material for this line was sponsored by Total Refining Chemicals.